Color has this amazing ability to evoke emotional responses from us. From the warm glow of a sunny summer afternoon to a cool refreshing early evening in fall. We associate colors with certain moods, places, feelings, and memories (consciously or not). Book have been written on color, and I am in no ways even remotely qualified to speak on it. So I won’t. Instead I am here today to maybe help shed some light on the use of the Curves tool in GIMP. 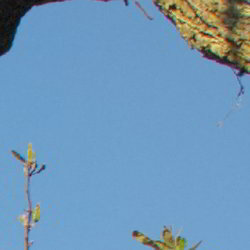 Open up an image in GIMP. Nope - don’t be shy now, zoom in more! So let’s investigate what goes into making your pixel. 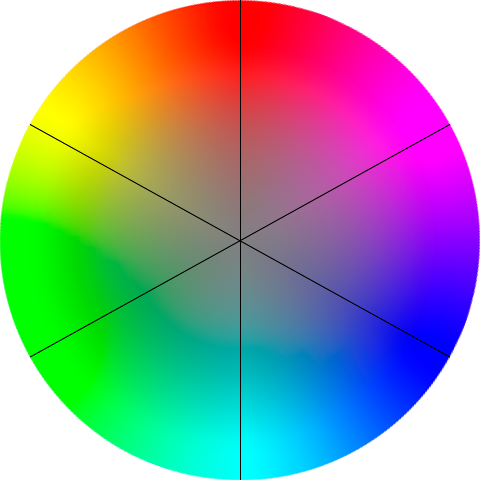 Remember, each pixel is represented by a combination of 3 colors: Red, Green, and Blue. 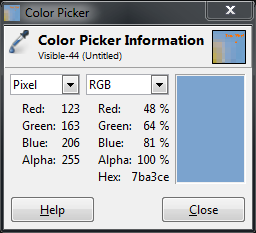 In GIMP (currently at 8-bit), that means that each RGB color can have a value from 0 - 255, and combining these three colors with varying levels in each channel will result in all the colors you can see in your image. If all three channels have a value of 255 - then the resulting color will be pure white. If all three channels have a value of 0 - then the resulting color will be pure black. If all three channels have the same value, then you will get a shade of gray (128,128,128 would be a middle gray color for instance). The RGB components that mix into your final blue pixel. As you can see, there is more blue than anything else (it is a blue-ish pixel after all), followed by green, then a dash of red. 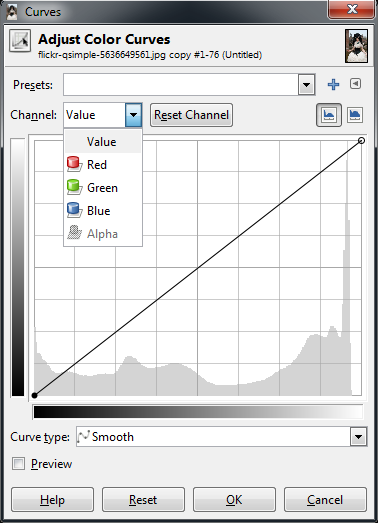 If we were to change the values of each channel, but kept ratio the same between Red, Green, and Blue, then we would keep the same color and just lighten or darken the pixel by some amount. So let’s leave your pixel alone for the time being, and actually have a look at the Curves dialog. I’ll be using this wonderful image by Eric from Flickr. 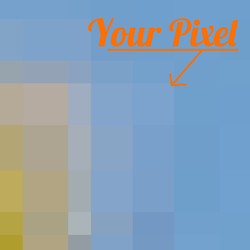 We can see that I start off with the curve for the Value of the pixels. I could also use the drop down for “Channel” to change to red, green or blue curves if I wanted to. For now let’s look at Value, though. In the main area of the dialog I am presented with a linear curve, behind which I will see a histogram of the value data for the entire image (showing the amount of each value across my image). Notice a spike in the high values on the right, and a small gap at the brightest values. 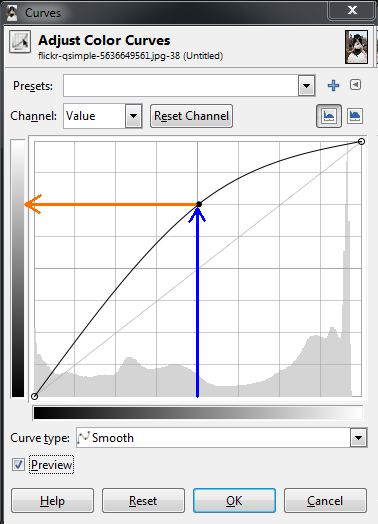 What we can do right now is to adjust the values of each pixel in the image using this curve. The best way to visualize it is to remember that the bottom range from black to white represents the current value of the pixels, and the left range is the value to be mapped to. 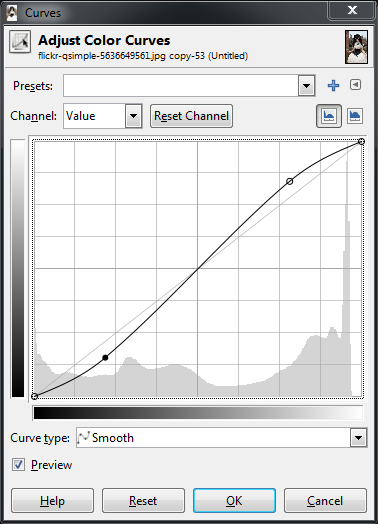 What this curve does is takes the values around the midtones, and pushes their values to be much lighter than they were. In this case, values around 128 were re-mapped to now be closer to 192. Because the curve is set Smooth, there will be a gradual transition for all the tones surrounding my point to be pulled in the same direction (this makes for a smoother fall-off as opposed to an abrupt change at one value). Because there is only a single point in the curve right now, this means that all values will be pulled higher. The results of pushing the midtones of the value curve higher (mouseover for original). Care should be taken when fiddling with these curves to not blow things out or destroy detail, of course. 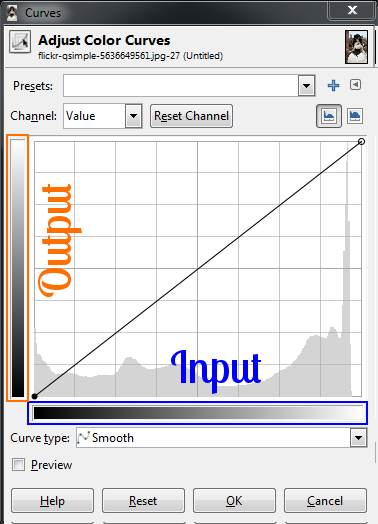 I only push the curves here to illustrate what they do. This will now cause dark values to become even darker, while the light values get a small boost. The curve still passes through the midpoint, so middle tones will stay closer to what they were. Slight “S” curve increases global contrast (mouseover for original). If there is one thing you take away from reading this, let it be the image above. So how does this apply to other channels? Let’s have a look. The exact same theory applies in the RGB channels as it did with values. 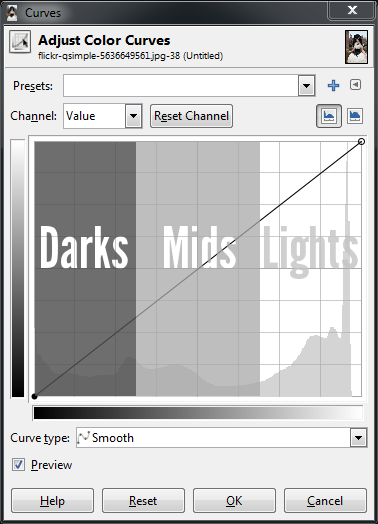 The relative positions of the darks, midtones, and lights are still the same in the curve dialog. The primary difference now is that you can control the contribution of color in specific tonal regions of your image. You choose which channel you want to adjust from the “Channel” drop-down. To begin demonstrating what happens here it helps to have an idea of generally what effect you would like to apply to your image. This is often the hardest part of adjusting the color tones if you don’t have a clear idea to start with. For example, perhaps we wanted to “cool” down the shadows of our image. 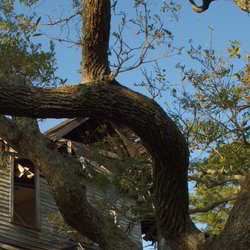 “Cool” shadows are commonly seen during the day in shadows out of direct sunlight. The light that does fall in shadows is mostly reflected light from a blue-ish sky, so the shadows will trend slightly more blue. To try this, let’s adjust the Blue channel to be a little more prominent in the darker tones of our image, but to get back to normal around the midtones and lighter. Pushing up blues in darker tones (mouseover for original). Now, here’s a question: If I wanted to “cool” the darker tones with more blue, what if I wanted to “warm” the lighter tones by adding a little yellow? What this means to you while manipulating curves is that if you drag a curve for blue up, you will boost the blue in that region of your image. If instead you drag the curve for blue down, you will be removing blues (or boosting the Yellows in that region of your image). Boost blues in darks, boost yellow in high tones (mouseover for original). Suppressing the green channel in darks/mids adds a bit of magenta (mouseover for original). In isolation, these curves are fun to play with, but I think that perhaps walking through some actual examples of color toning/grading would help to illustrate what I’m talking about here. I’ll choose a couple of common toning examples to show what happens when you begin mixing all three channels up. I use the term grading here because the first adjustment we will have a look at to illustrate curves is a horrible hollywood trend that is best described by Todd Miro on his blog. “Grading” is a term for color toning on film, and Todd’s post is a funny look at the prevalence of orange and teal in modern film palettes. So it’s worth a look just to see how silly this is (and hopefully to raise awareness of the obnoxiousness of this practice). The general thought here is that caucasian skin tones trend towards orange, and if you have a look at a complementary color on the color wheel, you’ll notice that directly opposite orange is a teal color. 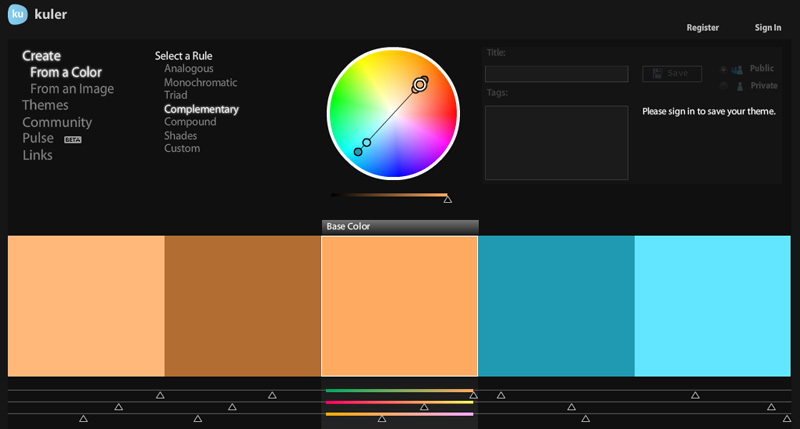 If you don’t already know about it, Adobe has online a fantastic tool for color visualization and palette creation called Kuler. 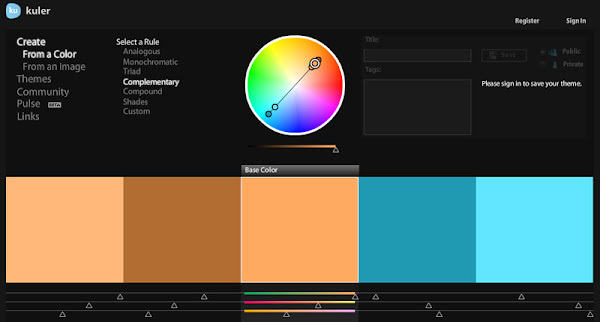 It lets you work on colors based on some classic rules, or even generate a color palette from images. Well worth a visit and a fantastic bookmark if you care at all about color. So a quick look at the desired effect would be to keep/boost the skin tones into a sort of orange-y pinkish color, and to push the darker tones into a teal/cyan combination. (Colorists on films tend to use a Lift, Gamma, Gain model, but we’ll just try this out with our curves here). Quick disclaimer - I am purposefully exaggerating these modifications to illustrate what they do. Like most things, moderation and restraint will go a long ways towards not causing your viewers eyeballs to bleed. Remember - light touch! So I know that I want to see my skin tones head into an orange-ish color. In my image the skin tones are in the upper mids/low highs range of values, so I will start around there. If you look back at the color wheel again, you’ll notice that between red and green, there is a yellow, and if you go a bit closer towards red the yellow turns to more of an orange. What this means is that if we add some more green to those same tones, the overall colors will start to shift towards an orange. So we can switch to the green channel now, put a point in the lower midtones again to hold things around normal, and slightly boost the green. Don’t boost it all the way to the reds, but about 2/3rds or so to taste. This puts a little more red/orange-y color into the tones around the skin. You could further adjust this by perhaps including a bit more yellow as well. To do this, I would again put an anchor point in the low mid tones on the blue channel, then slightly drop the blue curve in the upper tones to introduce a bit of yellow. Remember, we’re experimenting here so feel free to try things out as we move along. I may consider the upper tones to be finished at the moment, and now I would want to look at introducing a more blue/teal color into the darker tones. I can start by boosting a bit of blues in the dark tones. I’m going to use the anchor point I already created, and just push things up a bit. Now I want to make the darker tones a bit more teal in color. Remember the color wheel - teal is the absence of red - so we will drop down the red channel in the lower tones as well. And finally to push a very slight magenta into the dark tones as well, I’ll push down the green channel a bit. If I wanted to go a step further, I could also put an anchor point up close to the highest values to keep the brightest parts of the image closer to a white instead of carrying over a color cast from our previous operations. If your previous operations also darkened the image a bit, you could also now revisit the Value channel, and make modifications there as well. In my case I bumped the midtones of the image just a bit to brighten things up slightly. 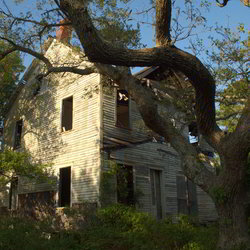 Finally to end up at something like this. After fooling around a bit - disgusting, isn’t it? (mouseover for original). Remember, think about what the color curves represent in your image to help you achieve your final results. Begin looking at the different tonalities in your image and how you’d like them appear as part of your final vision. For even more fun - realize that the colors in your images can help to invoke emotional responses in the viewer, and adjust things accordingly. I’ll leave it as an exercise for the reader to determine some of the associations between colors and different emotions. Phew! This might just be the longest post I have ever done here! I feel like I am only just scratching the surface of fun things to talk about on this topic, too. I think I should cut myself off here for the sake of (some sort of) brevity, however. I will be back soon with further discussion on this topic - especially emulation of some different films as well as some well known (and often overused) processes (cough Cross Process cough). I also promise some better examples and more subtle applications in my next post. In the meantime, have a read about emulating film types: Petteri Sulonen - Simulating Film Effects with Curves I have been absolutely in love with his Portra film emulation color curves for anything with a human being in it. As always, I welcome any feedback or thoughts in the comments!